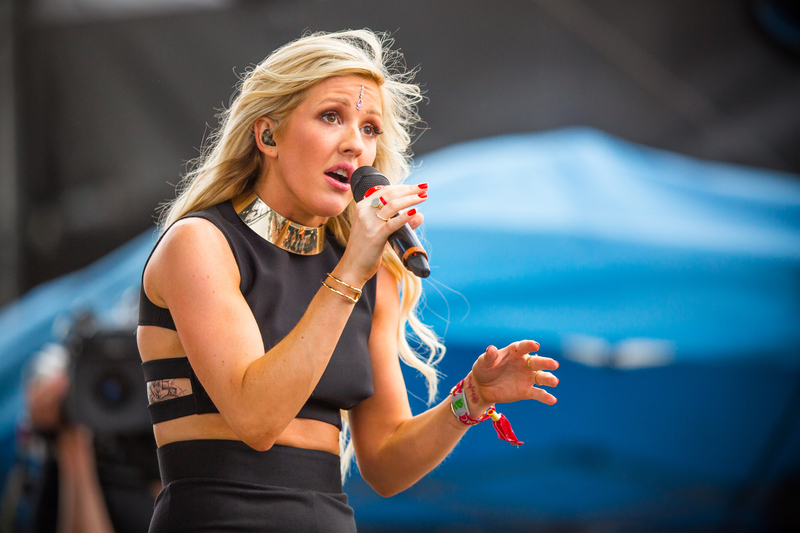 British electro-pop singer Ellie Goulding’s latest release, Delirium, displays noticeable growth. British electro-pop singer Ellie Goulding softens her signature EDM sound and embraces her folk roots in the well-balanced Delirium, her third studio album. Released on Nov. 6, this latest, lengthy record feels natural for Goulding. Her ethereal, soprano voice floats over 16 undeniably dance-worthy tracks. However, it also shows the artist expanding within her pop niche, allowing authentic instruments to meld with her electronic elements. According to her biography on Billboard.com, Goulding developed a love of folk music as a teenager but soon discovered electronic music while attending college in the United Kingdom. Following her chart-topping albums Lights (2011) and Halcyon (2012), Goulding has teamed up with some of pop’s biggest producers including Max Martin, who’s still riding high from his success co-writing and producing the three smash singles of Taylor Swift’s 1989. Mixing these two genres into a single pop-production, Delirium’s introductory track opens with a high-pitched vocal reverberation that crescendos into a symphony of violins and airy voices, reminiscent of ancient spiritual chants. Despite this haunting effect, the next track, “Aftertaste,” refurbishes these initial melancholy chants into upbeat backup vocals. Besides some manufactured percussion sounds, “Aftertaste” has punchy lyrics and a funky bassline that demonstrate that Goulding doesn’t need heavy EDM elements to create a catchy pop track. Arguably the album’s most danceable song, “We Can’t Move to This,” proves this further. The track includes soulful brass instruments that create an African-sounding beat, and Goulding keeps the energy high throughout with her catchy, sharp lyrics. “On My Mind,” another strong example of Goulding’s incorporation of rhythm guitar, includes a riff reminiscent of that from the Police. This song presents a defiant, yet confused tone with its staccato chorus, but still maintains a danceable beat. In fact, edginess and angsty expression is where Goulding really excels on this album with songs such as “Holding on For Life,” “Don’t Need Nobody” and “Codes.” With a hearty piano sound and clapping beat, “Holding on For Life” maintains a rushing pace that feels like Goulding is releasing an excess of emotion. Adding to these earnest expressions, “Codes” presents Goulding’s rap-like vocals as she fights to simplify a romantic affair. “Tell me black and white why you’re here tonight,” Goulding sings. Recorded for the Fifty Shades of Gray soundtrack, “Love Me Like You Do” serves as the peak of Goulding’s emotive power. Co-written by Martin and Swedish pop star Tove Lo, the song starts slow and takes listeners along, easily and calmly at first. Yet Goulding’s call of “What are you waiting for?” opens explosion of vocal emotion. Although the increased focus on folk elements presents a refreshing sense of growth, the songs on Delirium that still contain Goulding’s previous heavy EDM influence don’t necessarily fail. Considering the album’s pop focus, these songs still demonstrate Goulding’s ability to create smash party tracks. “Around U” is a playful track with Goulding’s airy voice, light synths and lyrics that express a desire to simplify a complicated love. In true EDM fashion, this song reconstructs the beat in unexpected places. “Don’t Panic” also features an EDM focus with heavy synths. The lyrics — a repetitious “Don’t Panic” — act like an internal voice during a drunken night out, comforting and still encouraging you to dance. Where Goulding loses ground, however, is in her handful of songs that fail to mix or even separately highlight her EDM and folk sound. Tracks like “Something In the Way You Move,” “Keep On Dancin” and “Scream it Out” feel like typical pop songs. Although catchy and potential chart toppers, these songs act like place fillers. They extend the album to a grudgingly long length and water down its more unique elements. Overall Goulding’s latest album shows considerable, deliberate musical experimentation but could have benefitted from cutting the excess of typical pop formations. Goulding will start a 2016 North American concert tour on April 1 in Vancouver, British Columbia.